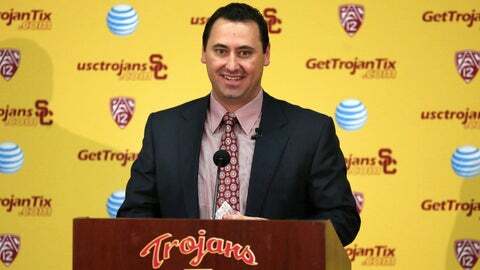 Steve Sarkisian spent seven years as an assistant coach at USC (2001-03, 2005-08). USC football coach Steve Sarkisian will join the first spring broadcast of ‘Trojans Live’ on Tuesday at 6 p.m. The show will broadcast live from The Lab on Figueroa next to Galen Center. Fans are encouraged to come and see the Trojans’ new head coach as he joins John Jackson and Jordan Moore. The spring season of #TrojansLive starts tomorrow (Jan 7) at 6 p.m. PT. Come down to @TheLabUSC to see @CoachSark, @byron_wesley and more! Sarkisian, in his third stint with USC (2001-03, 2005-08) was hired away from Washington last month to replace Lane Kiffin. In his short time as head coach, Sarkisian has secured eight verbal commitments for 2014, including CB Jonathan Lockett (Mater Dei), OT Chris Brown (Loyola), QB Jalen Greene (Serra) and TE Bryce Dixon (St. Bonaventure).